Kia announced a five-year plan with the goal of being the leader in green cars (hybrid, plug-in hybrid, all-electric and hydrogen fuel cell) by 2020. In total, the Korean company intends to launch 11 green models, but only some of them will be plug-ins. Investment in developments of new models is estimated at over $10 billion. "The new investment by Hyundai Motor Group, Kia's parent company, totals 11.3 trillion won (US$10.2 billion), for the development of a range of new eco-friendly models and building the facilities required for the brand's efforts to further reduce its CO2 output. The investment is likely to result in the creation of thousands of new jobs in domestic R&D positions." "Global market demand is shifting to electric vehicles, with oil prices predicted to rise in future. The electric and plug-in hybrid vehicle market will grow rapidly in the coming years, and this investment will enable Kia to meet the growing demand with a range of advanced new products and technologies." "We don't believe that there is any one 'silver bullet' that can satisfy the demand for low emission technology within the car industry, so we foresee a wide range of eco-friendly powertrains co-existing for an extended period of time. The plans we've announced today represent Kia's ambition to become a worldwide leader in advanced propulsion technology." Kia already offers the Soul EV all-electric car and in the second half of 2016 intends to introduce on the market an Optima plug-in hybrid, which currently appears in conventional versions and looks rather stunning. The Kia Optima plug-in is basically akin/sister to the Hyundai Sonata PHEV, which was just priced at $34,600 in the US. We expect the Optima to be priced similarly. 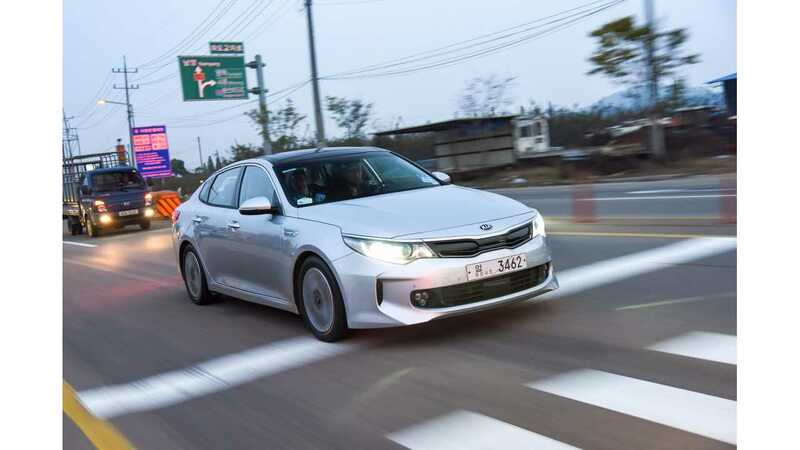 "A new addition to the Kia model line-up, the Optima Plug-in Hybrid (PHEV) will be Kia's first plug-in hybrid for global markets when it goes on sale in the second half of 2016, offering increased battery capacity and pure electric range. 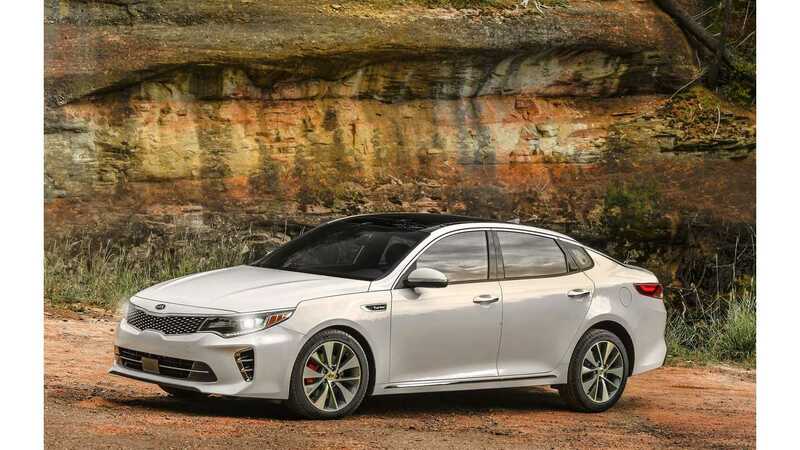 Meanwhile, the new Optima Hybrid (HEV) will offer buyers substantial improvements over the existing Optima Hybrid, with a larger battery pack, more powerful electric motor and revised transmission. These changes are expected to contribute to a 10% improvement in fuel economy over earlier versions of the Optima Hybrid. 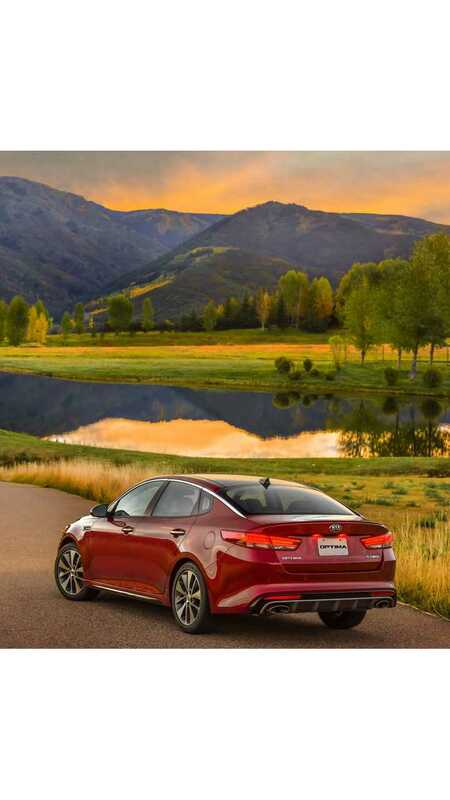 The Optima HEV is expected to go on sale across the majority of Kia's global markets in the first half of 2016. " "The Optima PHEV and HEV will offer their own distinct styling features to differentiate them from other models in the all-new Optima range. While the new Hybrid models boast the same modern styling which has proved so popular with buyers around the world, they each receive an active grille, engineered to balance improved aerodynamics with optimized engine bay cooling. A number of exterior elements – on the rear bumper, grille surround and wheel arches – feature silver brightwork and a clean metallic blue finish, as well as special ‘EcoHybrid’ and ‘EcoPlugin’ badging." Beyond specific upgrades to the exterior and interior, both the all-new Optima PHEV and Optima HEV will continue to offer the same modern exterior styling, and a bold interior design with more space for all occupants. Combined with an array of new technologies, and retaining the sporty image that has helped the Optima become one of Kia’s best-selling models worldwide, the all-new Optima range offers greater refinement, improved ride and handling and higher quality over the outgoing model." "The next-generation Optima PHEV will feature a 9.8 kWh lithium-polymer battery back – roughly six times the energy output of that found in the current-generation Optima Hybrid. Paired with a 50 kW electric motor – itself 42% more powerful than in the previous Optima hybrid version – the combination allows the Optima PHEV to operate in pure-electric mode at higher speeds. 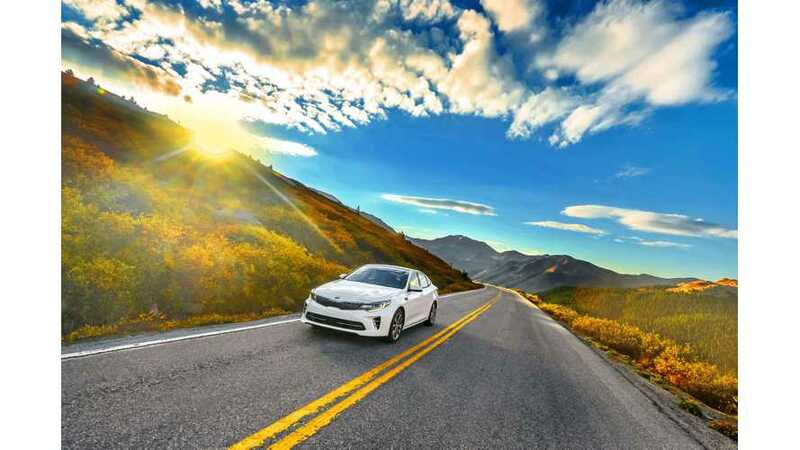 Engineering teams working on the Kia Optima PHEV are expecting the car to go on sale with the ability to travel up to 27 miles on electric power alone, placing the Optima PHEV among the leaders in the D-segment for pure-electric range. The innovative powertrain employs Kia’s efficient 2.0-liter ‘Nu’ four-cylinder GDI (gasoline direct injection) engine at its core, expected to generate 156 ps and 189 Nm. The engine is coupled with the electric motor, which allows the car to operate in charge-sustaining mode (just like the current Optima Hybrid) once the battery runs out of charge. The powertrain’s total power output is 205 ps at 6,000 rpm, with the application of the electric motor facilitating an immediate engine response to throttle inputs. This power will be applied to the road through a smooth-shifting six-speed automatic gearbox and the transmission-mounted 50 kW electric motor, which replaces the traditional torque converter in non-hybrid Optima models. The Optima PHEV will offer a seamless blend of highly-efficient electric and internal combustion power, and a consistently high level of performance. Based on internal tests carried out to date, the Optima PHEV is expected to deliver 99 MPGe combined (US), while engineers are targeting 40 mpg combined in charge-sustaining mode. Once plugged in, the PHEV will recharge in less than three hours at a 240V Level 2 charging station. To ensure the PHEV will stand out among the Optima range, the car boasts a series of visual modifications. These include a charging port integrated into the driver-side front fender, chrome side sill moldings, new wheel designs and ‘EcoPlug-In’ badging. In the cabin, the PHEV model is equipped with a distinctive instrument cluster, which displays information about the car’s functions and powertrain status, while a charge indicator on top of the dash allows drivers to easily see the state of charge from outside the vehicle (for instance, while it charges outside a home)." Kia said that hydrogen fuel cell cars also are included in the new five-year plan. "Fuel cell vehicle. As part of this five-year plan, Kia is targeting a 2020 launch for mass production of an all-new hydrogen fuel cell vehicle, featuring next-generation hydrogen fuel stack technology. Kia is working alongside 300 partner companies to develop the next-generation FCEV technology for global markets. Production of the new Kia FCEV is aimed to be around 1,000 units per year, a figure expected to rise as demand for fuel cell vehicles increases. Kia’s FCEV will feature a fuel stack similar in size to a 2.0-liter internal combustion engine, which development teams believe will offer drivers a high level of durability and power density from the advanced powertrain. Kia engineers are planning to develop the brand’s next-generation fuel cell stack to be 5% more efficient and offer 10% greater stack performance, despite being around 15% lighter and 15% lower in volume, compared to current generation fuel cell stacks. The result is a targeted range of more than 800 km (497 miles) from a single fill-up and a top speed of around 170 km/h (106 mph). The durability of the car’s fuel cell stack and electric motor will be comprehensively assessed, with tests of existing fuel cell stacks from Hyundai Motor Group covering more than 200,000 km (124,000 miles) on the road. Kia’s research into fuel cells date back to 1998, which resulted in the creation of the limited production Kia Mohave FCEV, able to travel up to 690 km on a single fill-up."